Before you start using Batch-Input method for inventory count entry you should be familiar with the usual transactions for manual entry of physical inventory counts and posting. Test the manual transactions, note down the entries, as you need to provide the same info in a batch-input. Use F1 field help, followed by click on technical field help to obtain the table names. SAP provides batch-input transactions that reference an existing physical inventory document as well as transactions to count without reference. If you want to use MI34 or MI38, then you have to create the physical inventory document with MI31 first. It can as well be created with MI01, but using MI01 does not make much sense if you are going to automate things, as it is a pure manual creation and probably needs factor 10 time than entering a count using the manual MI04 transaction. As the Logical file name is already defined by SAP we do not really need to bother about setting one up for ourselves, we can just use the given one, it worked right away in all systems I have tested these transactions in preparation for this blog. With customizing transaction FILE you can view how it is defined. Double click the folder Logical File Name Definition on the left, find the file name (that can be seen in e.g. MI34) then go into the detail. Alternative you can use SM30 with view V_FILENAME to get the same info. Further you can see that this file is expected in ASCII data format. Let us continue with the content of this file. SAP explains in the documentation that you can create a test file, this should help you to know what is needed. Start with MB52 to list the stock of one location in your plant. Then create a physical inventory document with just one or two materials using Mi31 or Mi01. So you know the plant, location, material number, batch number, unit of measure, quantity, stock type, the inventory document number, the inventory date and the count date. SAP help explains that you need to maintain table T159i to create a batch input with test data. You do this in SE16. Enter table name T159i, then click the create icon. Do this in your Development System, you probably do not have the authority for table maintenance with SE16 in production system. The other fields have to be maintained with the data from your physical inventory document, off course with the actual count and not with the book inventory from MB52 list. Remember, to create a zero count, it is not sufficient to enter 0 in ERFMG field; you have to set the indicator for zero count in field XNULL too. Now you can proceed in MI34 transaction. You activate the box in front of test data and execute. Please double click the message and read its long text. This is a warning only, it tells you that this listed file will be overwritten. Just think about what content this file has. If it has just test data from a test made by yourself then there is no harm to continue with Enter and have SAP overwrite the content of this file. But it could have productive data. Could it really? Probably not in a development system., but it could be test data from a colleague of you. After you had successfully written data do the file using the test data flag SAP gives you the following screen with information from the Batch Input session that was created. And you can process this session now from here clicking Process session, or you go into SM35 to process the batch input session. But before we actually execute the batch input session we should verify if it has the data in the right fields. This is less important for correct maintained test data from T159i table than later when you try with your own external data. Select the session, then click the analysis button. Now go to the tab Screens and click the button Display Field list. Now check if the content is at the right fields. This is as well a screen shot for MI39 transaction, but for MI34 you will see almost the same. The main purpose is to check if the content is in the right fields. If you are satisfied with the content, then you can execute the batch-input session. SAP recommends doing it in Error mode. I personally prefer to do it in foreground in the first test. Until here it was basically the technic how to execute the batch input with test data from table T159i. But more important is a test with own external data. Table T159i could already give you an idea how the data has to be. SAP says in the documentation that your file shall be based on table structure BISEG. 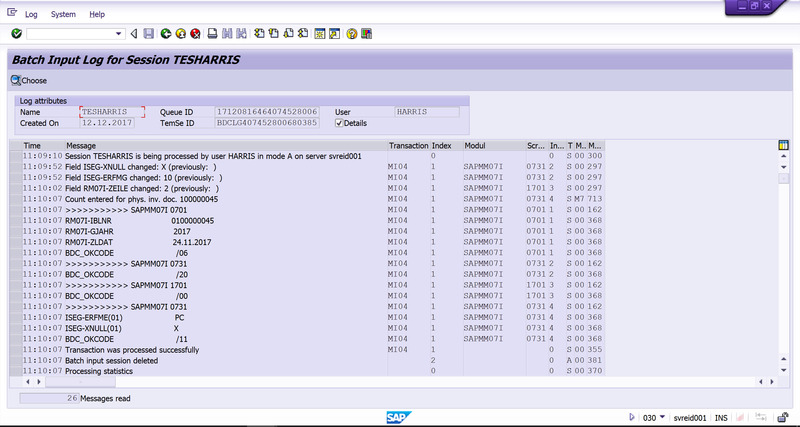 Execute SE80, select Repository Information System, drill down Objects > Abap Objects > Fields > Structure fields. Then enter BISEG as Structure name and click execute. SAP will give you a list with the field names, from there you can as well go into the details and see the field definitions. Alternative, just use SE11, enter BISEG as table and click display. This structure has all possible fields that could be needed in physical inventory process. Many of them are used for special stocks inventory. If you are familiar with all inventory types and with manual execution, then you should not be worried about those fields. But very important is to know how to prepare this file. This batch input process is in general used when the physical inventory is done in a legacy system. So you create this file with a program in your legacy system. Excel is not a legacy system. You must not have field names in the beginning of the file, there is no option to omit this info in the transactions. SAP expects the data in a sequential flat file respecting the field length of the BISEG structure. As the BISEG structure is like a mask that is put over your data in this file and then the program uses character 1 to 12 and moves the content to the field MAPPE (session), then it takes character 13 to 32 and moves the content to the field TCODE (transaction) and so on. Excel has columns, but it does not respect the field length. This is just garbage from plant number, storage location and material number, and cannot be loaded. How to get this external file into your SAP directory? You can use the standard transaction CG3Z for this purpose. It gives you option to search for your source file in your local PC via F4 . And the target directory and file name needs to be entered manually. Remember that you need ASC as format and activate the check box to Overwrite an existing file. Here you will not get any warning like it is in the MI34 transaction. Then you continue in the batch input transaction. Now you must not enter the Test flag. SAP will then read the data from your loaded file and create a batch input session. 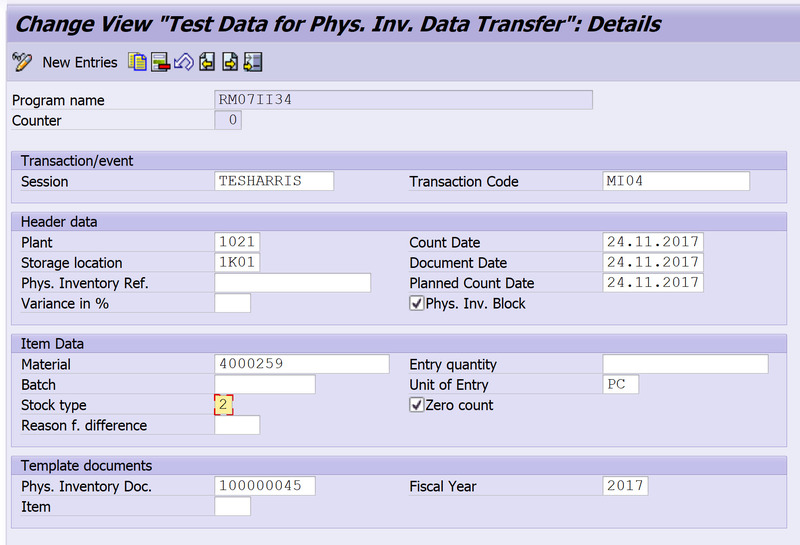 The Transaction without document references have a field for number of items. It is defaulted with 20, which means that SAP only takes 20 records into one inventory document, then another inventory document is created until all your items are processed. This field must not have a value bigger than 333. You cannot have more than 333 inventory items in one inventory document. There is no difference in mass processing with batch input method compered to the manual transactions. Can you please tell me the format for the MI34 upload phyinv34_38? I added it to excel and did a Save as text. I had already explained that Excel is not the medium for this. you need spaces between the numbers. Excel does not give you spaces, it only gives you delimiters. concatenate all your separate fields per row from the other tab into one field. of course you have to concatenate some spaces , so that it finally looks like expected. e.g. if a field length is 10 in structure BISEG and you have only 8 characters in your source, then you have to add 2 spaces before you concatenate the next field content. I did as you said when I upload the file to /usr/sap/trans/data it looks like this now. But when I execute the MI34 it says no list generated. I tested the process through the T159I table, which works fine. I checked the transaction FILE. In Logical file name definition, Cross-Client –>MMIM_PHYSICAL_INVENTORY_DOCUMENTS the data format is ASC. I used the same format when I uploaded the file through CG3Z. still get the same error. Compare your file with my screenshots from above. does it look equal? does not tell me much, I can just see 1 space between the fields. but if a field is 20 long and you have just MI04 in that field, then you need 16 more spaces. Based on your given example I cannot validate if it is in the correct layout, I actually doubt. I used Access instead of Excel where you can setup a table with field length. When you export this to txt-file you receive exactly what you need. You only have to remove counter in front of your lines. where is the material number? At least the plant number should show up between the transaction MI34 and the counting date. Look at the BISEG structure with SE11. What is the default directory used ? Then MI34, tells me that the file does not exist. The default directory is DIR_SAPUSERS. go to that directory using AL11 transaction and filter by last change date. you will see the file. I would like to point out that transaction FILE and the view V_FILENAME are not the same. Logical filenames can be configured as client-independent (Table FILENAMECI, Transaction FILE) or client-dependent (Table FILENAME, Transaction SF01, View V_FILENAME). The system/lookup function module will check the client-dependent setting first. Thank you for this valuable comment. When I run MI39 with the test data checkbox flagged (after I have maintained T159l) I do get a batch input session but the screens do not contain all the data I have put in that table. Basically screen 0700 is ok, but 0731 is blank. 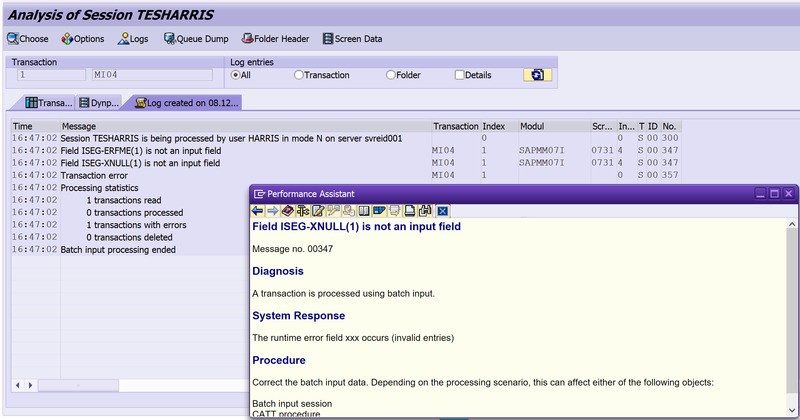 Post a question in MM forum and insert screenshots of your T159I table and from the batch input screens. I have entered data on table T159i in order to enter a count with MI39, but when i select test run it says that “sequential file cannot be opened”. I have full authorization and all data are maintained correctly. Do you have any clue? And for this you usually need to have extra authorization beside of the standard authorization for MI39. Unfortunately SAP has not captured any details in this message. then you can see that this keyword could have several exceptions. Those are the things that you have to check. Struggling with the “concatenate” part. I get all the fields from BISEG into my spreadsheet and fill up the necessary cells with the missing spaces (compared to the field lengths). Then I concatenate all the fields into one cell and run CG3Z to check the result. Finally it looks like this. Then I run MI40 and get this error message. Error creating a batch input session. Contact the person in charge. Can you see what’s missing with my data? Compare with my file I certainly see some differences. Excel does not have fixed field length, and I do not know how you filled the field an Excel cell with a certain number of spaces. Important is what you finally get when you save the spreadsheet as txt file. A text file using a monospaced font then it will take the same space for any character, so it is easily possible to count the number or spaces needed between two values. In the text file you just see the numbers or characters. Now imagine a put a mask over the numbers. this mask has the fields with the correct length from table BISEG. If had somewhere a space too much or to less then the value does not go into the right field and it looks scrambled, which finally leads to the fact that this cannot be interpreted by SAP. Exactly as you said. Now I have the correct spaces added after field values and it’s working. Thanks! I’ve created the sequential data file and uploaded it to the default directory DIR_SAPUSERS\phyinv34_38. If I run MI34 I get the meassage “no list generated”. If I run MI34 with ticked test data flag file phyinv34_38 will be overwritten with test data from T159i and batch input session is created. Any idea why MI34 not crete the bi session? look a few comments above at the comment from May 5 and compare your file with mine, I see yours is looking different, look at transaction MI04 and plant 1200 where it is positioned in your file and where in my file. There are even more differences looking further right in the file. I am trying to do MI34 but for some reason when I process the batch input, the fields are blank and my data from the text file is not entered in the fields. I saw this by processing the batch input in the foreground. I am trying to do MI34 for 2 line items only. I have created a physical inv. document already and entered it in my text file as well following the BISEG structure. I am getting the warning message “Sequential file…” when trying to do a test upload in MI34. I am not sure why the data is not picked up when I made sure that my text file is correct in terms of the structure. Below is a screenshot of my batch processing in the foreground. Hope you can share your expertise and point out where/what I am doing wrong. Thank you. Please post the complete warning message, and post a screenshot of the batch input session field list. Looks like the session analysis is empty. Not enough to post a count. I think your fields in the source file did not match the expected structure and could not be loaded to the right target fields. Thank you for the reply. I have checked it twice and the source file follows the expected structure. I am not sure why the program is not picking the data up and putting it into the fields. Any other thing that I can do? Am I missing something else? I am not sure if this is how you want the file since I cannot attach a file. Please let me know if you want me to email it directly to you instead. Thank you. When I navigate to transaction AL11 to the folder DIR_SAPUSERS, i can find the phyinv39_40 file, however, it is marked as not usable. Has the file to be usable? How can I change the status of this file? Using transaction SE16, Table T159I, to get testdata into the system, I get the error “MO429, No table entries found for specified key”. When a file has a length of zero then it is not usable in AL11 as SAP is not able to display nothing. You can’t change this status, you need to load a file which has content. if that many entry in SE16 do not find an entry then you should remove as much as possible from the selection screen to see if you have data. Also you have to enter a record prior to selecting it. the selection screen is already a step to far. Thankx for such a good explanation. serial number management requires to enter serial numbers along with the count, the batch input is not able to do that. Just a technical limitation of a very old program. there is much too less information in that statement. In short the materials need to be counted which is a manual effort, the counts need to be entered, which is also a manual effort in Excel, in SAP, or in any custom program unless you do the count with scanners. I mean to say that user will count the Item inventory manually, and maintain the excel. Now i need to upload that excel in sap, so i was facing error in uploading inventory of serialized items. And what I wanted to say is that maintaining the count in Excel is adding work instead of making things quicker, a) you have to prepare the Excel sheet with the items to be counted, and b) it has to be maintained manually and c) you need an extra program to upload it. You are right but maintaining Excel is easier then maintaining directly in SAP from end user perspective. If we can provide an excel upload for serialized inventory it would be beneficial for them. what about WM count ? Your blog is very useful, but I’m facing problem while creating test file. First , I have created PID 100000045, though TCODE MI31. Second, I have created test file in table T159i. I give a tick mark for Test Data and I encountered problem after executing session ini SM35. Am I doing it wrongly ? where is my mistake..? I know for sure that in case I had the 0731 screen twice in a batch input like yours, then the second occurrence would usually be protected, speak it has no input fields. I think I know the cause of my mistake. I did not entry the line number in PID in my previous attempt. As you suggest me to do it foreground, I fill the line number in the process. But unfortunately insufficient for my purpose. Nevertheless, maybe you people can help me anwering this question. Does anyone know if there is a standard method to take physical inventory count with serialized materials via batch input? I don’t see any field in BISEG structure in which I can enter the counted serial numbers. So I think this method doesn’t work for me. I created PID through MI31. I run MI34 without tick Test Data and tick Log result. where is my mistake in these steps ? It looks like you are not reading from the uploaded file, so check the setup for file and paths and compare the found values with the directory and file name of your upload. When I try to run MI39 in background mode, the batch input session is terminating right after it encounters the first erroneous input record. Error could be related to material not existing or physical inventory record already being active, etc. Is it possible to make MI39 process the entire input file skipping the erroneous data records, and show all those error messages in the session log? I would like to correct all those erroneous records and reprocess them with MI39 in a second session. Click the info button in the MI39 selection screen, based on the docu there it should behalf as any other batch input session when it comes to an error situation. Do you see something in the log or do you get a short dump? It is hard to imagine where exactly your MI39 terminates. Do you see the session in SM35? Here is my MI39 Batch Input session log from SM35; it shows that it encountered error on the first input record and after that the session ended even though there are 9 more records in my input file.